One of my son’s favorite books is a very torn up copy of National Geographic Readers: Trains . It is so loved that I think I can read it with my eyes closed. Although it is designed for children a little bit older (ages 4-6), he doesn’t seem to know that! When I was contact by Moms Meet Blogger to do a review on National Geographic Kids Books I was more than excited!!!!! When the boxed arrive, I couldn’t wait to open the box and start turning the pages. Each book is geared for children preschool age and older, and is packed with information to engage young curious minds. I immediately opened the book First Big Book of Why to the page on “Why Do Doughnuts have holes?” — and no the answer isn’t so that you can eat the donut holes. I then read through Everything Pets. What a great book for a child that lives or wants a pet. Of course there were many more books in the collection sent to me to review that ranged from jokes, to almanacs- all were designed to get your child excited and engaged in learning (sounds like great Christmas gifts to me!). 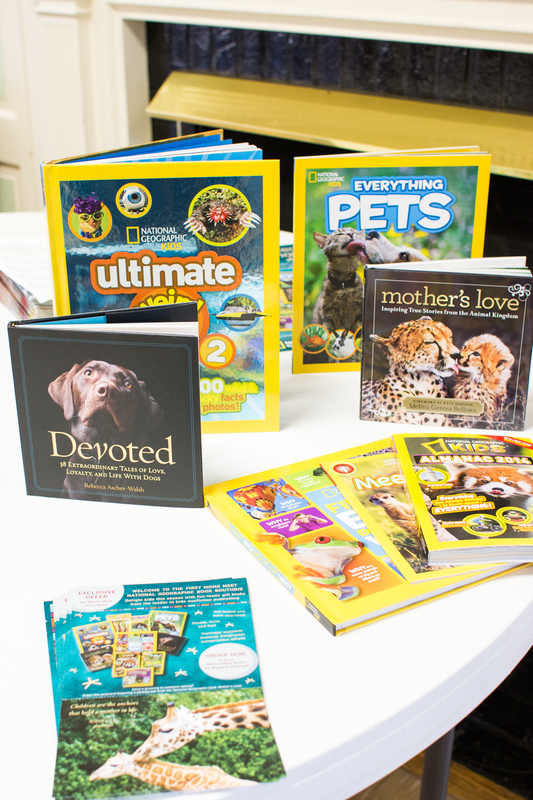 National Geographic Books are available wherever books are sold, including national book chains, online retailers, independent bookstores, discount wholesale clubs, toy stores, specialty retailers, and more. Exclusive Offer! Got over to the Moms Meet National Geographic Book Boutique to save 30% on the listed books. The ladies at WHUMC MOPS were able to get a first hand look at the books (scroll down to see the pictures of the books on display), that included a giveaway of a few titles. The feed back from the group was that the books had a ton of information presented in a fun and engaging manner. Good news dear reader, you too can be entered to win a copy of Devoted, a Tale of Life with Dogs, for ages 10 to Adult. Devoted: In this heartwarming gift book, author Rebecca Ascher-Walsh presents a collection of inspiring dog stories and touching photos–dogs who comfort veterans, dogs who learn to surf, dogs who detect cancer, and dogs who save the day: Each one is devoted. These 38 uplifting dog stories showcase the most amazing dog rescues, accomplishments, and abilities that fascinate us and touch our hearts. Thought I would share — My favorite time to read with my son is before he goes to bed– he gets to pick three books. We also read during snack time, if we have snack at home. Seems like snack time is on the go many days. As for personal reading, I like to do that right before bed with the TV on! I like to read at night when I get into bed, before I go to sleep. I always read to relax before bed! I love reading in the later evening. Our kids love reading. We read individually and together. We spend a hour on the weekend reading together. I like to read anytime, but mainly when I have a good chunk of time and don’t feel like I’m constantly watching the clock. I like to read at night, but once I am into a book, it’s pretty much arund the clock. I love reading with my son, we read books together alot.